Digital data is all around us. In fact, we create around 2.5 quintillion bytes of data every single day, with 90% of the world’s digital insights generated in the last two years alone. If utilized correctly, data offers a wealth of opportunity to individuals and companies looking to improve their business’ intelligence, operational efficiency, profitability, and growth over time. In this day and age, a failure to leverage digital data to your advantage could prove disastrous to your business – it’s akin to walking down a busy street wearing a blindfold. With the rate of available data growing exponentially, it’s crucial to work with the right online reporting tools to not only segment, curate, and analyze large data sets but also uncover answers to new questions that you didn’t even know existed. And when it comes to finding actionable answers to specific questions, adhoc analysis and reporting are essential. We will explain the ad hoc reporting meaning, benefits, uses in the real world, but first, let’s start with the ad hoc reporting definition. Exclusive Bonus Content: An Essential Guide to Ad Hoc Reporting! Download our pocket-sized summary and become a reporting master! 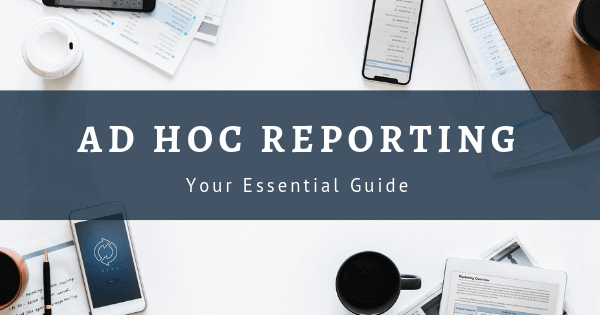 What Is An Ad Hoc Report? Ad hoc reporting, also known as a one-time report, is created for a particular purpose or business necessity. It helps its users to answer critical business questions immediately by creating an autonomous report, without the need to wait for standard analysis. Working alongside recurring or ongoing (daily, weekly, or monthly) data reports, ad hoc reporting forms a vital part of any business, brand, or organization’s growth and sustainability by offering a level of insight that adds an extra layer of substance and success to the data driven decision making process. While ad hoc reports are typically developed using SQL (Structured Query Language) by an IT department which can take several days, there are tools and platforms that allow non-technical business users access to these most precious of insights, by simply using a SQL report generator. And this lies in the essence of the ad hoc reporting definition; providing quick reports for single use, without generating complicated SQL queries. Moreover, a host of ad hoc analysis or reporting platforms boast integrated data visualization tools to help enhance the data exploration process. This reduces the reliance on software developers or IT personnel for simple analysis and reporting. What Is Ad Hoc Analysis? Adhoc analysis is a business intelligence (BI) initiative which serves to provide answers to specific, standalone business challenges or questions using more current data. Ad Hoc describes things created on the spot, as-needed, usually for single use only. With ad hoc analysis, users often create a report that does not currently exist, or drill deeper into an existing dashboard report to achieve a deeper level of insight that ultimately benefits the ongoing success and sustainability of the organization. Ad hoc data analysis is the discoveries and subsequent action a user takes as a result of exploring, examining, and drawing tangible conclusions from an ad hoc report. Typically, ad hoc data analysis involves discovering, presenting, and actioning information for a smaller, more niche audience and is slightly more visual than a standard static report. There’s no doubt about it: adhoc data analysis offers a wealth of value to businesses across industries and sectors. To demonstrate the potential of ad-hoc analysis, let’s delve deeper into the practical applications of this invaluable data-driven initiative in the business world. 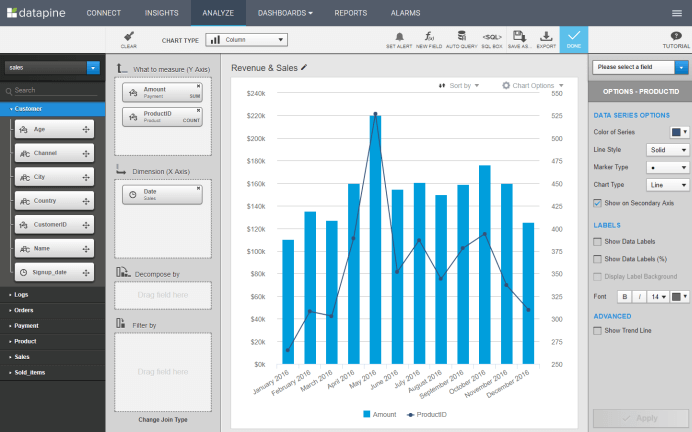 Sales: Ad hoc reporting and analysis can be used in a company with a large sales database. Let’s say a user wants to find out a specific sales outcome related to a particular scenario, s/he would build a single report, used only once, to provide that result. This scenario can be found in companies which have a large outside-sales force which then can export an ad hoc report showing results from his/her territory (number of clients visited, or leads generated) against overall sales goals. Healthcare: Another ad hoc reporting example we can focus on is healthcare. A physician may not know how to build an HTML report or run a SQL query, but an ad hoc reporting tool can easily generate data that are needed quickly, and only once – a blood test report, for example. Ad-hoc analysis has served to revolutionize the healthcare sector. Utilizing a healthcare analytics software by providing greater data visibility and improving accuracy while helping senior stakeholders in such institutions make swift and accurate decisions that ultimately save lives, improves operational efficiencies, and decreases mortality rates. Government: Governmental entities deal with a wealth of critical information, insights, and decisions that ultimately affect a lot of people. By gaining the ability to hone in on very specific tasks or challenges and reach the level of insight needed to make accurate, prosperous decisions while automating once manual data gathering tasks, governmental bodies across the globe enjoy improved public fund allocation while boosting productivity. A testament to the power of adhoc analysis. Retail: Adhoc data analysis proves particularly effective in loss prevention in the retail sector. Through store-specific retail analytics report, tailored to particular areas of loss prevention, such as shoplifting or employee theft, a host of notable retailers have been able to track inventories and spot trends that have saved them a great deal of money in the long run. Education: The educational sector is vital to the future of our society, and ad hoc data analysis has played a significant role by streamlining a host of processes through focused data and analytical reporting. It also facilitates the sharing of information between departments to help engage students on a deeper, more personal level. This level of initiative results in improved success for faculty, students, and in turn – the economy. Finance: An additional ad hoc reporting example can be focused on finance. By its very nature, the financial industry (or the financial departments) is rife with facts, figures, financial KPIs, metrics, and data. Adhoc data analysis has offered businesses the means to drill down deep into very concentrated segments of data – or business aims – gaining the ability to spot trends that will provide the best return on investment (ROI). While these are the primary industries that benefit from ad hoc data analysis, regardless of your sector, by utilizing reports like this alongside interactive business intelligence dashboards, you will see notable improvements in key areas of your business. The self-service nature of ad hoc reporting catalyzes the report creation process by allowing end users to work with customized reports on niche areas of the business without relying on the technical assistance of developers. This saves time and costs while minimizing any potential interdepartmental roadblocks. As ad hoc data analysis platforms or dashboards are intuitive and visual by nature, uncovering the right answers to the right questions is simpler than ever before, allowing users to make decisions and roll out initiatives that help improve their business without the need of wading through daunted streams of data. Ad hoc data analysis offers an interactive reporting experience, empowering end users to make modifications or additions in real-time. As report elements are picked individually, users can ask questions and make customizations that suit their needs and goals. It is of utmost importance to answer business questions as quickly as possible, and one of the benefits of ad hoc reporting provides just that – the possibility to follow the ever-changing business environment, as the business moment requires and evolves. By having access to different data sources in one single place, an ad hoc report can easily answer current and upcoming business questions with every piece of data a company has. With solid ad hoc reporting software, it’s possible to apply controls to specific dashboards by adding elements like screen filters, sliders, conditional formatting for filtering, and link reporting dashboards for direct comparison. That way all data can be easily accessed and managed. It’s clear that ad hoc reporting offers a host of benefits to the ongoing success and growth of any ambitious modern business. And when it comes to an ad hoc reporting software that offers freedom, flexibility, and usability while helping answer critical questions both swiftly and accurately, our data visualization, ad hoc reporting tool ticks all the boxes. Aimed specifically at the end user, our different types of dashboards and self-service reporting tools are intuitive and accessible, which means you don’t have to possess a wealth of technical knowledge to utilize our platforms. The drag-and-drop interfaces make handling important data sets both logical and digestible. Moreover, our cutting-edge algorithms run in the background of our applications to fortify our interface with enhanced built-in intelligence to help you during every step of your adhoc data analysis journey. For ad hoc reporting on the go, our tools, applications, and dashboards also allow you to monitor data and generate fresh insights any time, anywhere with your web browser or tablet, safe in the knowledge that your data privacy and security is being preserved to the highest standards. At datapine, we’ve invested an incredible level of time and effort in developing an enterprise-level security layer akin to core banking applications. As a result, it’s possible to copy existing data into our data warehouse to speed up your workload or retain your data in-house by connecting datapine to your server remotely. And as you’re free from the shackles of managing your data from one specific location, sharing your dashboards, KPI reports, discoveries and insights with colleagues are possible with just a few clicks. To discover more about our tools, solutions, and services, explore our business intelligence features page. If you want to delve deeper into the power of superior data analysis, then our, completely free, 14-day trial will help you to start your journey towards data-driven enlightenment!